"Everywhere we go, we are surrounded by screens. Have we entered a Techno utopia or a virtual prison? ", Producer and co-director, Phillip Telfer asks this and other pertinent questions in the new documentary “Captivated: Finding Freedom in a Media Captive Culture” released by Media Talk 101. After reading this quote, I knew right away that the Captivated DVD was one that I needed to see. We had recently dealt with a situation in our home where one of our children was sneaking their iPod to bed with them each night so they could watch TV. It didn't stop there. Instead of doing school work, this child was also doing the same thing during school time. When he was caught, his exact words were, "I feel like a burden has been lifted." This allowed us to see just how addicting and strong social media, games, and TV can be. The screen time for the average American child is over 53 hours per week! 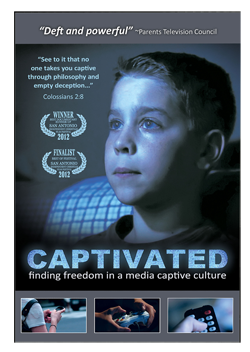 Captivated is an award winning documentary, 107 minutes long, in full color, and available on DVD and on demand. It is intended for viewing by adults but approved for all ages. You will find many people sharing their own stories similar to ours on how they found themselves sucked into all types of media. You will hear from many family experts, media experts, church leaders, and inspiring individuals who share their thoughts on the current media age, its increase and the demand of attention that it is taking on our society. The concept behind the film brings us back to the Bible where Colossians 2:8 says "See to it that no one takes you captive through philosophy and empty deception..." It brings forth pertinent questions for each individual and family to examine for themselves. It is shared from a biblical worldview. The documentary is not saying that we should never have anything to do with media again but that we should use discernment as to what we are filling the majority of our time with. You can watch the trailer to see if Captivated looks like something your family needs to see. We are definitely a media captivated family. I spend just as much time in front of a screen (if not more) as my children do. We went for a one week media fast last year and I'm not going to lie - it was HARD. I keep saying we need to do it again but you know what, do I really want to? I have to hesitantly answer that question with no. I blog, vlog, instagram, tweet, facebook, etc. Do I even know how much time I spend on all of this? Sadly, no I do not. I could relate so much to the lady in the video who talked about playing Farmville. She became sick and couldn't tend to her farm and came back to a mess. She couldn't believe the feelings that this destroyed virtual world left her with. That was her wake up call. Who cares if my virtual farm has weeds and all the animals are loose. It is not real! Why am I letting this stuff get to me? Does it matter? No, it does not! The Captivated DVD was so eye opening and convicting for me. I had my children watching with me. The child who is just as addicted as his mom said, "I'm not so sure about that DVD." Another child who limits their own time on video games and technology said, "that was eye opening" and didn't want to miss watching a minute of it. Although, some of it was difficult for my youngest child (age 10), it was a great documentary for our entire family to watch. Again, Captivated was intended for adults to view but approved for all ages. As a Christian, my focus needs to be on God and Him alone. I need to be in His Word and when I am He will continue to convict me to turn away from the things of this world that do no matter. I don't think all media is bad but there is definitely a fine line of balance that you have to be intentional about or you can be completely sucked in. During the film, Dr. Jeff Myers, president of Summit Ministries made this statement about Robert Pittman, the founder of MTV who said, "we don't just shoot for 14 year olds, we own them." That's a sickening statement for me. The enemy is real and he's fighting for our minds and souls and for the minds and souls of our children. These things allow him to take our focus off of what it should be on - God and God alone! We need to armor up with His Word and His Word alone. I am now happy to say that there will be more media fasts in our future! I'm not saying it will be easy, but it will be done! I think this DVD should be watched by all families! Purchase Captivated There are several available options for purchasing Captivated. The Captivated DVD cost $16.95 with free shipping. Right now, you can purchase 2 DVDs and get the 2nd one for $5 making the total cost of both $21.95 with free shipping. Click here to see more buying options. You can also find out more about Media Talk 101 on Facebook and Twitter. Click the banner below to find out what my fellow crewmates thought about Captivated.